Veterans say new program for health care is a bureaucratic nightmare. A U.S. Department of Veteran Affairs program intended to create better access to health care for veterans in remote locations, including on Martha’s Vineyard, has instead left them angry and frustrated. The Veteran’s Choice program allows veterans in locations where access to VA facilities is difficult to get medical care from the private sector. The VA does not deliver the care directly, but contracts with the private company HealthNet, which administers the program for the eastern United States. At a meeting Tuesday afternoon, Island veterans and VA officials cited numerous examples where trying to navigate the HealthNet system has become a bureaucratic nightmare. Susan MacKenzie, director of the VA’s Providence medical center, Lisa Felix, assistant chief of patient services, and public affairs officer Win Danielson 3rd traveled to the Vineyard to meet with veterans concerned about their medical care. Also attending the meeting at the American Legion hall in Vineyard Haven was Dr. Monty VanBeber from the VA’s Hyannis clinic. Dr. VanBeber travels to the Island once a month to provide medical care to Island veterans. About 30 Island veterans also attended. Woody Williams, a veteran, was also frustrated and doubted whether the problems can be solved. VA officials confirmed their contractor is not performing as expected, or as required by contract. Ms. MacKenzie said in some cases, authorization for an appointment is being sent after the date of the appointment. “They need to schedule you within five days, and we know that’s not happening,” said Ms. Felix. Ms. MacKenzie stressed that nothing has changed with the current VA arrangement on the Vineyard. Veterans can still see Martha’s Vineyard Hospital doctors, or see Dr. VanBeber when he comes to the Island, just as they did before. If they elect to use Veterans Choice, they are required to call HealthNet for pre-authorization and must see a health care provider in their network. But that process has not gone smoothly, according to veterans and VA officials alike. Dr. VanBeber told the Island veterans to expect problems with services such as X-rays and lab tests, because many routine service providers are not yet affiliated with HealthNet. But they said doctors at the Vineyard hospital are already affiliated with HealthNet and can accept patients through the Veterans Choice program. “Our goal here today is to run interference,” said Ms. MacKenzie. She urged veterans to call the VA first, and said a VA advocate could participate in a three-way phone call with HealthNet representatives. The VA officials said HealthNet has hired 300 new employees to address the issues, and the VA has hired its own additional staff to help with problems. Brad Kieffer, a spokesman for HealthNet, said later in an email to the Gazette that the company is working to be responsive to the problem. 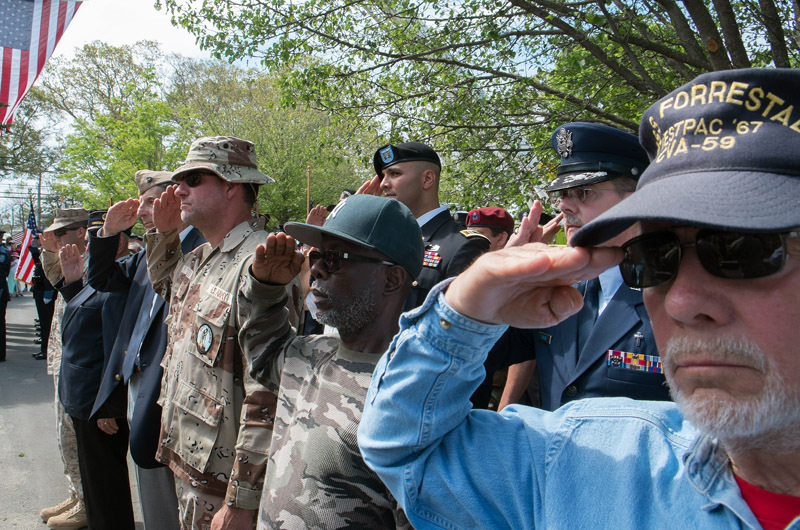 “When we are made aware of specific situations, we take action on behalf of veterans. Additionally, we are working closely with VA to improve satisfaction levels and to educate both veterans and health care providers about the Veterans Choice program,” he wrote. I am very curious to see if there will be any outrage from our fellow civilian citizens as their silence was deafening each time before when there were these issues. You want to know all about this Obama Care, and what this administration is doing to veterans not for veterans, just ask A Vet! BTW Thank you MV Gazette for reporting this so accurately. The MV Times took Cong Keating`s BS Spinning Press Release and praised how wonderful this is going and how proud he (Keating) is to have been a part of it! I cannot wait for TRUMP to become president and to help and once again respect our veterans, "BUILD THAT WALL" and deport all illegals which will help elevate our terrible island housing crisis and not to forget to rebuild our military so we can sleep better at night and to know that all we and our families have sacrificed was not totally in vain. I am a vet and nurse and work for the VA. My job is to approve the consults for vets to get medical treatment outside the VA system. The problem we are having is that we are so short staffed ,nurses and clerical support, that it takes months to get a consult processed to even go to Healthnet. I have complained and written letters to my supervisors but nothing has changed. They keep adding more for us to do when we are already drowning in work. I have been counseled on my complaining in order to help the veterans. My voice is falling on deaf ears. i dont know what to do. I hope all of you who voted for this Crazy man in our White House are happy! This is happening to veterans all over our entire country! Ha You can pick your own doctor, cant see whats in it until it is passed, it going to save you so much money, everybody will be able to see a doctor. Ha Illegal Aliens get better treatment then our Veterans. In closing, I hope all of you who voted for this Crazy man in our White House are happy! The picture posted on page 12 about the veterans shows Firemen, Not veterans! I think what is a terrible disgrace that people want Illegals to get all these rights and benefits, come one come all, they say don't even think of building a wall. and not a peep from any of those people questioning how are veterans are being kicked to the curb, mistreated and abandoned! Every body knows this has been happening! Obama says how he is trying to reform of the veteran care system and still over 900,000 vets still have pending health care applications with the Department of Veterans Affairs. More than 300,000 vets are believed to be dead, most died while waiting for a response trying to get medical care and to top things off some veteran's widows have received letters from the VA to their husbands saying "Greetings, Mr ******* we now have a appointment scheduled for you to see a Cardiovascular Specialists on November 22, 2015. Please bring a list of all your medications. Please arrive 30 minutes before your appointment or it could be canceled. Thank you for your service". The widow called the VA in tears and said "My husband died two months ago"! I ask where is the public outrage people, things like this are happening constantly and as you can see things are getting worst for our veterans? Clearly the Vet that passed didnt send in the proper paperwork or place the proper phone call or self enter his demise into myhealthevet. Shame on him. Veteran's Choice program is a farce. I tried to call them on 7 different days, all day and ran the batteries dead on 3 phones in my house to no avail. Finallt on the 8th day after holding for 3-1/2 hrs a lady answered. I was transferred to 4 different people in healthnet and then they took my veteran info and then told me they would call me back in about days with a POSSIBLE apt for a service that is NOT available at the Dayton Ohio VA. If there was a problem with the date- I would have to call them back and go thru this process again- its worse now than before. PEOPLE- you have made it worse!!!!! I developed a hernia so I called the Veterans Choice Program, the only Dr approved in their program in my area is Dr Beverely Richardson, a eye dr ! So will she operate on a hernia? I think not !! The VA has to approve all specialities and then it goes to Healthnet so the Veterans Choice program is not able to assist without this approval and hands are tied until a response is made by the VA so The actually problems all fall back to the VA not the program. The blame is being misguided on a program that really is not the root of all evil demands need to be made to untie the hands of the program so it can better assist the Veterans and not to jump thru hoops for the VA. Healthnet would rather jump hoops for our Veterans not the Va. Those working for Veterans Choice do everything they can to get the care our veterans so deserve. The VA. Wants the program to fail and have made things difficult for Healthnet to succeed they have gone as far as holding consults or not providing needed medical documentation to get the care privately until weeks to months later and then they submit huge waves so that they back log Healthnet so it takes them longer to sift thru all the paper work. Most private Dr's have no problem accepting the Veteran but become frustrated because the VA is so slow in helping these Dr's with needed information to properly provide care and then make it impossible to have the private Dr write scripts for treatment because if not filled by the VA the Vetrans have to pay out of pocket and wait months for reimbursement. The simple truth they want the funding given to the Veterans Choice and Choice first back in their pocket book and will sacrifice getting our veterans care more timely by putting up road blocks to cause a good program to fail. It's really to bad this happening and wish the truth could be heard before something good is gone and our veterans are left in even more crisis. Healthnet is about the veteran and the va is about the bottom line and only see veterans as a $ sign flashing. It is no matter what kind of Dr you see. I have been sent too two different Doctors in Augusta Ga in the last year because of long wait times and have yet to get any treatment. Going to play devil's advocate here but what is not being taken into prospective here is that Healthnet was not given the high volume of Veterans that would need to help when the VA hospitals could not see a Veteran for 30 days. In the last few weeks there staff has more than tripled. The call center has over a 1000 people taking calls. So the volume was not what was previously been reported. This program is for all of the US not just the East Coast. So taken into prospective that we are talking over 10000 new cases coming in weekly new Healthnet that is this care went back to the VA the waiting time would be far greater than anyone has had to wait to now. All of these Veterans qualified for the program because the VA was taking over 30 days or 40 miles from the nearest VA so can you imagine if the VA did take back this program the wait time and response time would be far worse than anything else. It's a new program almost a year old and in the last few months have really taken steps to make this successful and positive for our Veterans and I would hate to see this go away because the program was developed to help our Veterans who were not getting timely care and when it started up no one new how bad things were until it happened. So give it a chance the benefits are huge Healthnet just had to deal with unseen growing pains. There is no doubt that Health Net is awful, yet the Providence V.A. has done very little in the way of assisting veterans who ask for their assistance. I speak from first hand experience. They can deflect all they want, but the simple answer is that now they have an excuse for their lack of accountability. Greg I am so sorry that happened you and by no means is acceptable on any level. The VA requires that any auth expired that Healthnet has to send back to their care and they will then make a decision to extend the date, but the Customer Service person should of flagged your account as escalated so that someone from our care team could of contacted the VA immediately about getting this done. Please accept my sincerest apologies and know everyone on the Healthnet Nursing Team is working to resolve such inexcusable care that you received. Everything about this has been unacceptable. I'm not willing to pin all the blame on one organization. When providers don't fill out a simple form like the Request for Additional Services, when the Providence Outside Care/Choice Act refuses to return messages via email or phone call, when the local Clinic Dr. & RN's treat healthcare patients like fast food employees treat customers, & when HealthNet has people working the front line of customer service who are ill equipped, the veteran pays the price. All need to take accountability, ASAP.